The meeting in the secure room at the Pentagon called “the tank” included Vice President Mike Pence, Secretary of State Mike Pompeo, CIA Director Gina Haspel, and Trump’s national security adviser John Bolton, among others. The session was a classified briefing about Afghanistan, according to a White House official who spoke on condition of anonymity to discuss the subject of the private briefing. The Taliban has long claimed it will only negotiation with Kabul after the complete withdrawal of foreign forces. Despite U.S. insistence that the Afghan government owns and leads the Taliban peace pact negotiations, the terrorist group continues to refuse to allow Kabul to participate. The inclusion of Kabul in the negotiations has proven to be difficult and has surfaced as one of the top, if not the primary, point of contention between the two sides. While visiting Washington last week, Hamdullah Mohib, Afghan President Ashraf Ghani’s national security adviser, also accused U.S. Afghan reconciliation envoy Zalmay Khalilzad of keeping Kabul in the dark about the negotiations with the Taliban, which considers the Afghan government a “puppet” unworthy of a chair on the negotiation table. Nevertheless, Mohib’s criticism of the ongoing peace efforts, which various analysts and U.S. officials believe it is closer to potentially ending the more than 17-year-old war than ever before — triggered a meeting between Trump and his team on Friday. The Taliban — which much like its Islamic State (ISIS/ISIL) rival is fighting to implement strict Islamic laws or sharia — considers itself the only legitimate government of Afghanistan. Taliban jihadis do control or contest more than 45 percent of Afghan districts — mainly located in rural areas. The group also controls or contests and more than a third (36 percent) of the country’s population. U.S. troops invaded Afghanistan in October 2001 after the Taliban harbored the 9/11 perpetrators al-Qaeda. By the end of 2001, the U.S. ousted the ruling Taliban regime (1996-2001), but the potential peace deal could allow the group to return to Kabul as a legitimate political power. In recent months, the Trump administration has stepped up its efforts to achieve a negotiated reconciliation between Kabul and the Taliban — the primary goal of the its strategy to end the war, which has been raging since October 2001 at a tremendous blood and treasure cost to Americans of $1 trillion, 2,278 U.S. military fatalities, and 20,431 injuries. 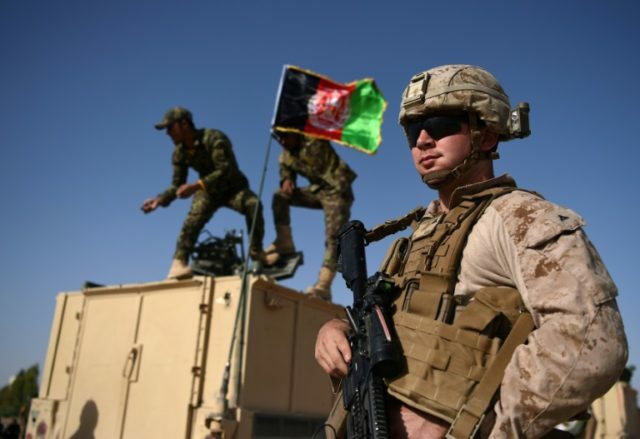 The most extended round yet of negotiations between the Taliban and the U.S. concluded last week, eliciting a draft agreement on U.S. withdrawal and promises from the Taliban that it will not allow Afghanistan to harbor international terrorists once again. Although there was no mention of a specific timeline for foreign troops to leave Afghanistan as part of the draft accord, the Pentagon was expected to offer a plan to pull out American troops between three to five years, but the Taliban rejected that offer, demanding that they leave in one year instead. The Trump administration has signaled that it plans to leave behind a residual American force to ensure the Taliban keeps its promises of not harboring jihadis, among other things, but the Taliban has also rebuffed that offer. The Taliban claims it will only engage in talks with Kabul after foreign forces leave Afghanistan.